University labs, fueled with millions of dollars in funding and some of the biggest brains around, are bursting with new research into computer and networking technologies. This free website, Duolingo, from a pair of Carnegie Mellon University computer scientists serves double duty: It helps people learn new languages while also translating the text on Web pages into different languages. CMU's Luis von Ahn and Severin Hacker have attracted more than 100,000 people in a beta test of the system, which initially offered free language lessons in English, Spanish, French and German, with the computer offering advice and guidance on unknown words. Using the system could go a long way toward translating the Web, many of whose pages are unreadable by those whose language skills are narrow. Von Ahn is a veteran of such crowdsourcing technologies, having created online reCAPTCHA puzzles to cut down on spam while simultaneously digitizing old books and periodicals. Von Ahn's spinoff company, reCAPTCHA, was acquired by Google in 2009. Duolingo, spun off in November to offer commercial and free translation services, received $3.3 million in funding from Union Square Ventures, actor Ashton Kutcher and others. Princeton University Computer Science researchers envision an Internet that is more flexible for data center operators and more useful to mobile users. Princeton's open source Serval system is what Assistant Professor of Computer Science Michael Freedman calls a Service Access Layer that sits between the IP Network Layer (Layer 3) and Transport Layer (Layer 4), where it can work with unmodified network devices. Serval's purpose is to make Web services such as Gmail and Facebook more easily accessible, regardless of where an end user is, via a services naming scheme that augments what the researchers call an IP address set-up "designed for communication between fixed hosts with topology-dependent addresses." Data center operators could benefit by running Web servers in virtual machines across the cloud and rely less on traditional load balancers. Serval, which Freedman describes as a "replacement" technology, will likely have its first production applications in service-provider networks. "Its largest benefits come from more dynamic settings, so its features most clearly benefit the cloud and mobile spaces," he says. If any of this sounds similar to software-defined networking (SDN), there are in fact connections. Freedman worked on an SDN/OpenFlow project at Stanford University called Ethane that was spun out into a startup called Nicira for which VMware recently plunked down $1.26 billion. Researchers at Germany'sTechnical University in Darmstadt have described a way for home Wi-Fi routers to form a backup mesh network to be used by the police, firefighters and other emergency personnel in the case of a disaster or other incident that wipes out standard cell and phone systems. The proliferation of Wi-Fi routers makes the researchers confident that a dense enough ad hoc network could be created, but they noted that a lack of unsecured routers would require municipalities to work with citizens to allow for the devices to be easily switched into emergency mode. The big question is whether enough citizens would really allow such access, even if security was assured. University of Tulsa engineers want to slow everything down, for just a few milliseconds, to help network administrations avoid cyberattacks. By slowing traffic, the researchers figure more malware can be detected and then headed off via an algorithm that signals at hyperspeed to set up defenses. Though researcher Sujeet Shenoi told the publication New Scientist that it might not be cheap to set up such a defense system, between the caching system and reserved data pipes needed to support the signals. University of Washington researchers have created a card game called Control-Alt-Hack that's designed to introduce computer science students to security topics. The game, funded in part by Intel Labs and the National Science Foundation, made its debut at the Black Hat security conference in Las Vegas over the summer. The tabletop game involves three to six players working for an outfit dubbed Hackers, Inc., that conducts security audits and consulting, and players are issued challenges, such as hacking a hotel mini bar payment system or wireless medical implant, or converting a robotic vacuum cleaner into a toy. 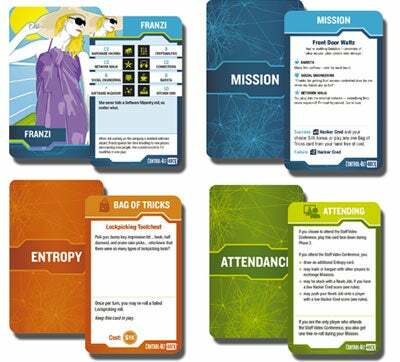 The game features cards (including descriptions of well-rounded hackers who rock climb, ride motorcycles and do more than sit at their computers), dice, mission cards, "hacker cred tokens" and other pieces, and is designed for players ages 14 and up. It takes about an hour to play a game. No computer security degree needed. "We went out of our way to incorporate humor," said co-creator Tamara Denning, a UW doctoral student in computer science and engineering, referring to the hacker descriptions and challenges on the cards. "We wanted it to be based in reality, but more importantly we want it to be fun for the players." This effort, focused on nixing malware like Flame that spreads from computer to computer via USB storage drives, got its start based on research from Sebastian Poeplau at Bonn University's Institute of Computer Science. Now it's being overseen by the broader Honeynet Project. The breakthrough by Poeplau and colleagues was to create a virtual drive that runs inside a USB drive to snag malware. According to the project website: "Basically, the honeypot emulates a USB storage device. If your machine is infected by malware that uses such devices for propagation, the honeypot will trick it into infecting the emulated device." One catch: the security technology only works on Windows XP 32 bit, for starters. Practical applications for running IP over xylophones might be a stretch, but doing so can teach you a few things about the truly ubiquitous protocol. A University of California Berkeley researcher named R. Stuart Geiger led this project, which he discussed earlier this year at the Association for Computing Machinery's Conference on Human Factors in Computing Systems. Geiger's Internet Protocol over Xylophone Players (IPoXP) provides a fully compliant IP connection between two computers. His setup uses a pair of Arduino microcontrollers, some sensors, a pair of xylophones and two people to play the xylophones. The exercise provided some insights into the field of Human-Computer Interaction (HCI). It emulates a technique HCI specialists use to design interfaces called umwelt, which is a practice of imagining what the world must look like to the potential users of the interface. This experiment allowed participants to get the feel for what it would be like to be a circuit. San Francisco State University and other researchers are puzzling over why so many software projects wind up getting ditched, fail or get completed, but late and over budget. The key, they've discovered, is rethinking how software engineers are trained and managed to ensure they can work as teams. The researchers, also from Florida Atlantic University and Fulda University in Germany, are conducting a National Science Foundation-funded study with their students that they hope will result in a software model that can predict whether a team is likely to fail. Their study will entail collecting information on how often software engineering students - teamed with students at the same university and at others -- meet, email each other, etc. "We want to give advice to teachers and industry leaders on how to manage their teams," says Dragutin Petkovic, professor and chair of SF State's Computer Science Department. "Research overwhelmingly shows that it is 'soft skills,' how people work together, that are the most critical to success." Forget about 3G, 4G and the rest: University of Arkansas engineering researchers are focused on developing very low-power wireless systems that can grab data from remote sensors regardless of distortion along the network path. These distortion-tolerant systems would enable sensors, powered by batteries or energy-harvesting, to remain in the field for long periods of time and withstand rough conditions to monitor diverse things such as tunnel stability and animal health. By tolerating distortion, the devices would expend less energy on trying to clean up communications channels. "If we accept the fact that distortion is inevitable in practical communication systems, why not directly design a system that is naturally tolerant to distortion?" says Jingxian Wu, assistant professor of electrical engineering. The National Science Foundation is backing this research with $280,000 in funding. University of Waterloo engineering researchers have developed a way for wireless voice and data signals to be sent and received simultaneously on a single radio channel frequency, a breakthrough they say could make for better performing, more easily connected and more secure networks. "This means wireless companies can increase the bandwidth of voice and data services by at least a factor of two by sending and receiving at the same time, and potentially by a much higher factor through better adaptive transmission and user management in existing networks," said Amir Khandani, a Waterloo electrical and computer engineering professor, in a statement. He says the cost for hardware and antennas to support such a system wouldn't cost any more than for current one-way systems. Next up is getting industry involved in bringing such technology into the standards process. Next steps require industry involvement by including two-way in forthcoming standards to enable wide spread implementation. The Waterloo research was funded in part by the Canada Foundation for Innovation and the Ontario Ministry of Research and Innovation. Current lithium ion batteries are almost all variations on the same basic form: an inflexible block with electrodes at one end. Because they cannot easily be shaped, they sometimes restrict designers, particularly when it comes to small gadgets with curved surfaces, but the Rice prototypes could change that. "Today, we only have a few form factors of batteries, but this battery can be fabricated to fill the space available," said Singh. The battery is sprayed on in five layers: two current collectors sandwich a cathode, a polymer separator and an anode. The result is a battery that can be sprayed on to plastics, metal and ceramics. The researchers are hoping to attract interest from electronics companies, which Singh estimates could put it into production relatively easily. "Airburshing technology is well-established. At an industrial level it could be done very fast," she said. Two MIT researchers formally unveiled over the summer a protocol called State Synchronization Protocol (SSP) and a remote log-in program using it dubbed Mosh (for mobile shell) that's intended as an alternative to Secure Shell (SSH) for ensuring good connectivity for mobile clients even when dealing with low bandwidth connections. SSP and Mosh have been made available for free, on GNU/Linux, FreeBSD and OS X, via an MIT website. SSH, often used by network and system admins for remotely logging into servers, traditionally connects computers via TCP, but it's that use of TCP that creates headaches for mobile users, since TCP assumes that the two endpoints are fixed, says Keith Winstein, a graduate student with MIT's Computer Science and Artificial Intelligence Lab (CSAIL), and Mosh's lead developer. "This is not a great way to do real-time communications," Winstein says. SSP uses UDP, a connectionless, stateless transport mechanism that could be useful for stabilizing mobile usage of apps from Gmail to Skype. Researchers from MIT, California Institute of Technology and University of Technology in Munich are putting network coding and error-correction coding to use in an effort to measure capacity of wired, and more challengingly, even small wireless networks (read their paper here for the gory details).